Get ready for the vacation of a lifetime. Sandpiper Cove Resort has something for everyone. Move into a beautifully furnished studio: Perfect for a couple or a family of four. Children always welcome. No smoking please. A queen size Murphy bed pulls down out of the closet and the sofa converts into a queen-size bed. The condo is on the ground floor with parking directly in front of the unit. It has a 24 hour security/guard house. The 1100 foot private beach is 220 paces away. Umbrellas and Beach chairs are available. Try a little volleyball, Sunbathe, get a snack at the beach-side snack bar (seasonal) or just play in the sugar white sand. Showers, restrooms and the Pavilion are there for your use. Bring your boat and moor it on the peaceful canals in Destin Harbor. Sandpiper Cove has its own private marina and boat ramp (free). Head to the gulf, Chatawhatchee Bay, or the Bayous. Try your hand at crabbing or fishing. Do you scuba dive or snorkel? Be prepared for a real treat. Catch your own lobster for dinner or marvel at the beauty of the marine life on the limestone reefs. You might even want to dive on a sunken wreck. Try out any of these free activities at Sandpiper Cove: Nine-hole, par three golf course; five swimming pools with one off the back patio; three hot tubs; six tennis courts (three lighted); shuffleboard, horseshoes; and ocean kayaks. The Louisiana Lagniappe Restaurant is located within the resort. Amenities: Telephone, Air Conditioning, Cable, TV, VCR, Full Kitchen, Microwave, Dishwasher, Refrigerator, Cooking utensils provided, Linens provided, Hot Tub (shared), 5 Pools (one off patio (shared), Shared Washer and Dryer. Activities: Golf for free on the resorts- Nine hole, par three course. PLEASE EMAIL FOR ACCURATE QUOTE George and I are retired grandparents who use our vacation rental for our family vacations and rent to others for the balance of the year. We were looking for a vacation rental which would fit our family needs: 1) Affordable; 2) 24/7 security 3) Close beach access 4) Activities for kids and grown-ups 5) Close to vacation attractions. We found it all with our unit at Sandpiper Cove. A gated 43 acre condominium community with its own private access beach allows you to get out and walk or ride your bike without worrying about strangers and traffic. Swimming, tennis, shuffle board, horse shoes and par three golf. Bring your gulf clubs and play the free nine hole par three pitch & putt golf course. Had everything we needed and short walk to beach. 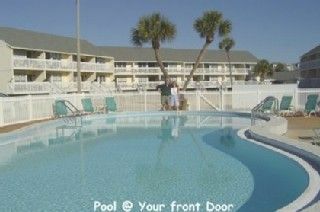 The owners were very accommodating and we enjoyed our stay! There were a couple minor things that we had issues with. The laundry had not been done and was piled in the bathtub but we were able to do laundry on site and there were clean towels in the closet for us. It was a great location and we literally walked across the street to the ocean! Everyone was very kind. Highly recommend for a more quiet stay in Destin. Thank you for advising us of a totally unacceptable situation. When George & I travel, we do not expect to arrive to find the laundry not done . . . . . .and neither should our guests. Our cleaning company has been advised that this situation must not be repeated and will not be tolerated. nice cozy place, we enjoyed our stay. Very nice, great location, plenty to do without leaving the community. The condo was clean and perfect for 3-4. We saw so much wildlife between the docks, the canal and around the property. It so fun. We will visit again. You are about to experience the natural beauty of Florida's Emerald Coast, where sand is like sugar and the Gulf waters are aquarium clear and emerald green. These unspoiled surroundings foster life-long memories of family vacations and unforgettable romantic getaways. 2017 at 2015 Prices. Please e-mail us for our best seasonal rate.